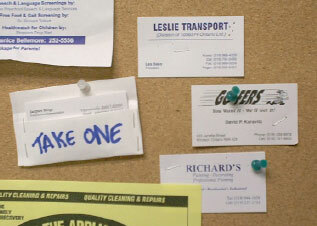 A subscriber to this blog mentioned a cool, new, low-tech idea for displaying your business cards that I think is worth a mention. The company is called CardCues and they have come up with a great new idea that makes you think “Why didn’t I think of this?”. Quite simply CardCues make your business cards stand out! It is perfect for bulletin boards, trade shows, open houses, direct marketing events and more! Each holder can display 40 business cards and either pins to a bulletin board or stands up-right on a desk. CardCues fold together in seconds and display easily on bulletin boards or any flat surface. Each holder displays over 40 cards. The cost is only $6.99 + $3.95 shipping. If you are interested, but in a hurry give me a call at 800-568-8338 and I can get the ball rolling for you. Whether your are just venturing out into the world wide web looking for business card displays for the first time or you’re a seasoned business card display owner. You’ll find more types and sizes of displays at AdPockets.com. than anywhere on the planet. 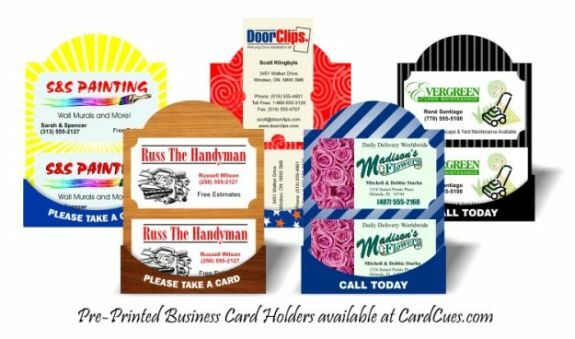 I know you’ll find many business card displays available on the market today and you’ll probably be a little overwhelmed on how they all work……..and which is right for you. There’s also a lot of hype out there about making a fortune with business card displays as a business…. And at AdPockets.com we have a hype free no pie in the sky guarantee we won’t sling hype around just to get you to purchase displays from us ..and….. we’ll try to address many of the questions that you’ll have about the business card displays and industry surrounding them…. This is only one of the many things we give you that our tightlipped limited competition out there can’t and won’t. At AdPockets we’ll give you honest answers about what’s available on the market today…. and as a matter of fact we’ll and even provide you our competitor’s website addresses. Now how’s that for an honest comparison approach…. You may wonder why we would do this and the answer is very simple…. We are so confident that we can make the perfect display for you that we are willing to help you compare others to ours by providing their information to you… in so doing this provides AdPockets the chance to show you what we can do compared to what they can’t. AdPockets.com displays are 100% Made in the USA with clients that stretch across the globe in many other countries and cities. I know your looking for business card displays, with not only have an attractive price tag… but they must function properly, look great, and have options for fitting in with any location’s décor or special needs. At AdPockets.com we try to create displays to fit the needs of many many markets and we hope you’ll let us know if you find a market we haven’t thought of yet. We create business card displays with you in mind and what you want to do with them. What you’ll not find at AdPockets.com are displays stuck in a one color one size fits all scenario. We offer hundreds of combinations and plenty of great display types. It’s what we specialize in. We would like to caution you about a few business card display discussion forums out there that are meant only sway you to purchase displays from one particular company or sell you information about business card displays as a business. Further more they have nothing good to say about us and the other business card display companies out there. Their after your dollars and only provide bias comparison information. So spend some time surfing over our site http://www.adpockets.com to see if there’s a display that you like. You won’t find another business card display company with so many great options for making the perfect display for you. We appreciate your time look forward to hearing from you. For additional information fill out our information request form by clicking on the contact button located at the top of each web page. Thank you for your interest in AdPockets.com enjoy spending time looking at all our great displays.